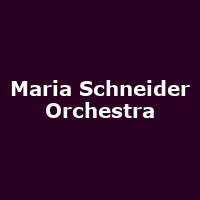 Maria Schneider is a multi award-winning American composer band-leader. Maria made history with her 2004 album "Concert in the Garden" which was the first Grammy Award-winning recording sold exclusively via the Internet, and additionally was funded by her fans. As well as album awards, Maria has won "Composer of the Year", "Arranger of the Year" and "Large Jazz Ensemble of the Year" for her band - and that was all in one year (2005). She released her debut album, "Evanescence" in 1994, followed by: "Coming About" (1996), "Allégresse" (2000), "Concert in the Garden" (2004), "Sky Blue" (2007), "Winter Morning Walks" (2013), "The Thompson Fields" (2015), plus 2019's: "Data Lords".